Very much in the Open spirit of the Boston symposium, it now has a Creative Commons 4.0 CC-BY-SA license. That’s not quite the big deal that it might sound since the Overview pages that describe all Agendashift-based workshops have long had one, but it’s good to get that sorted. Its structure now tallies with recent improvements. Day 1 is Learning the language of outcomes. 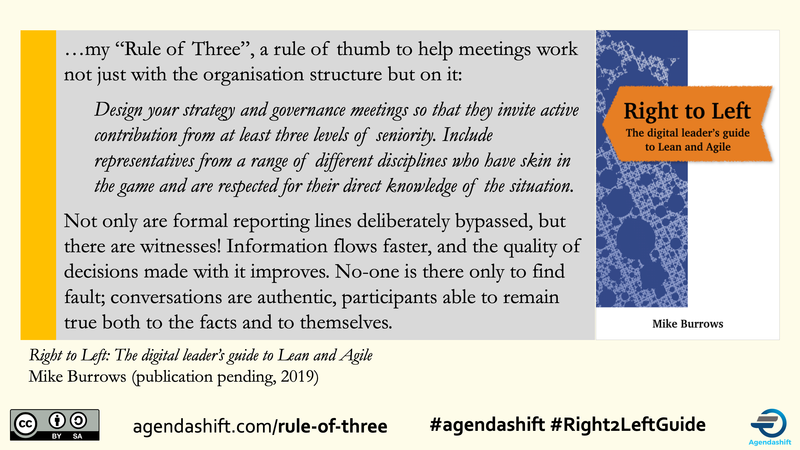 Day 2 is Organising for impact, and it reflects the “rejigging” described in last week’s Notes from the April 2019 Advanced Agendashift workshop, London. I’ve updated the abovementioned Overview pages also. In person or online, I hope to see you soon! Watch this space for Greece, Turkey, London, and the Benelux region in the autumn. Fantastic 2-day Workshop by @asplake on @agendashift so much information, tools and most of all: coherence in applying tools and methods. Also, details of the next four of these workshops – Boston, Berlin, Oslo, and Stockholm. Announced only a couple of weeks ago, I would definitely recommend using Mike Haber’s template – it makes the exercise easier for everyone involved, and the output vastly more presentable. I’ve updated the Celebration-5W page to make it more prominent. No-one missed the old “Is there a relationship between X and Y?” question (a question that comes with health warnings) and according to the retro sticky, the new question “Where does X come from?” rocks! I mentioned my “Rule of Three” in answer to an important question about who should be invited to internal workshops. I had already written it up for my forthcoming book Right to Left but I was encouraged to put together a page for it with an easy-to-remember url, agendashift.com/rule-of-three. Clicking on the image or the link above you’ll find a condensed, bullet point version, and some notes that hint at what’s to come in the book. Consolidating experiments described in Stringing it together with Reverse Wardley, The Cynefin Four Points exercise moves from day 1 to day 2, the launchpad for Mapping rather than the conclusion to Exploration. It allowed me to run “my slowest ever Discovery” on day 1, and nobody minded one bit. Update: The name “Reverse Wardley” is (as we say in the UK) “a bit Marmite”, meaning that some loved it and others hated it. Is it “way too geeky”? This was already suspected, but I still don’t have a better alternative. Before Right to Left is even published, perhaps a spinoff! Definitely one to watch. Subscribers to the 15-minute FOTO Dropbox may have noticed a new ‘ v12 BETA’ version of the cue card. 15-minute FOTO is our Clean Language-inspired coaching game, the name being short for “From Obstacles to Outcomes in just 15 minutes”. We’ll be testing this updated version – twice! – at the London workshop early next month (and while we’re here, note that early bird pricing expires tomorrow). Dropped the question “Is there a relationship between X and Y”. Quite simply, this question was more trouble than it was worth. That it needed health warnings was already a strong indication that it should go, and learning that this question seems to have few defenders among expert Clean Language users clinched it for me. Added “Where does X come from?” as an alternative to “What happens before X?”. I’m taking advantage of the space relinquished by the first change to add a question that I find useful. You can use it to follow system flows upstream (from Right to Left, so to speak), and also to explore abstract outcomes – “Where does that collaboration come from?”, for example (see also My favourite Clean Language question). The two questions “What would you like to have happen?” and “And when X, then what happens” are highlighted more clearly than before. In the game, when presented with (respectively) an obstacle or an outcome, these are the default questions to use, the former to ‘flip’ obstacles to outcomes and the latter to generate more outcomes, going deeper into outcome space. Additional visual cues: a boundary between the obstacle and outcome ‘spaces’, along with a reminder (the curved arrow) to use the WWYLTHH question in the event that the conversations lingers unproductively inside obstacle space. For the time being, you can download a PDF here. For the source pptx file, the facilitator’s deck, and for continued updates, subscribe here. You’ll find a video there too. Questions or ideas for improvements? #cleanlanguage in the Agendashift Slack. And see chapters 1 and 2 of the Agendashift book, where the exercise is described in depth and in context (twice). We describe our coaching game 15-minute FOTO  as “Clean Language-inspired”, and as shown on the cue card (below) it makes use of a small subset of the Clean Language questions, a subset particularly suited to exploring or modelling (ie building a model of) a landscape of obstacles and (especially) outcomes. The objective of the game and its function in Agendashift is to generate a good number of outcomes that can then be organised in various interesting ways. Through subsequent exercises we facilitate agreement on outcomes, thereby helping to co-create the basis for organisational change. Those goals aren’t quite the same as those of Clean Language, and through my favourite Clean Language question I hope to say a bit about the latter. “What would you like to have happen?”, which tends to “flip” obstacles into outcomes, moving from the negative to the positive, quickly identifying the outcome that might be found hiding behind the obstacle (figuratively speaking). “And when X, then what happens?”, which when the X is an outcome, generates another, and sometimes several. Asked a few times, a surprisingly long chain of outcomes can be generated with the minimum of prompting from the coach. Let me further illustrate the “What kind of X?” (WKO) question with an everyday scenario that I frequently find helpful as an example. You have just told me that you’ll be on holiday next week. How do I respond? Some possible responses politely close the conversation before it gets started: “That’s nice!”, “I hope you have a lovely time!”, and so on. I might show some interest with a question: “Where are you going?”. Unfortunately, this well-intentioned question is not entirely without risk. Suppose your answer is “I’m not going anywhere, I’m staying at home”. Awkward! Have I embarrassed you? To be clear, “Where are you going?” isn’t a terrible question. It is at least an open question, a question to which might be given a wide range of possible answers. This is in contrast with binary questions that expect mainly yes/no answers or leading questions which are mostly about the questioner’s own agenda (in the Agendashift book  I describe the latter as not genuine). The possible flaw in the question “Where are you going?” is that it makes an assumption that might not be valid in this context, the assumption that you’re going somewhere. “What kind of holiday?” removes that assumption – in fact it is about as stripped of assumption as a question can get. As a result, it is much more likely to lead to an interesting answer, one that I can’t easily predict. This is what Clean Language is all about. It’s not about the killer question, a trick that like the world’s funniest joke soon gets old. It’s about putting the coach’s assumptions to one side, because what’s in the mind of the client is far more valuable. As well as heightening curiosity it improves listening, because we can’t fill in those X‘s if we’re not paying attention. And although there is some skill in choosing the question (a skill that we begin to develop by playing the game), it’s not about leading the client on the strength of the coach’s domain knowledge – there’s a time and place for that, but not yet. Instead, it’s about facilitating a process, one that helps navigate what may be complex issues, often helping the client arrive at some real insights. 15-minute FOTO is carefully framed as a game: it works within clear constraints and with clear goals. It’s not therapy, and never pretends to be. But for some it has been the gateway to the Clean Language body of knowledge with its generous community and has kindled interest in a deeper kind of coaching. And that’s wonderful! Acknowledgements: I’m grateful to Johan Nordin, Steve Williams, and Mike Haber for feedback on earlier drafts of this post. Quick one: Massimo Sarti has kindly translated the 15-minute FOTO cue card into Italian. Thanks to Alex Pukinskis, we have it in German also. If you’d like either one of these, just go to the 15-minute FOTO page, request the materials as usual, and mention which one you’d like. Massimo’s translation is particularly timely: since July’s roundup we now have a booking page up for the Core Agendashift workshop Facilitating Outcome-Oriented Change in Brescia, Italy on November 9th, ahead of Italian Agile Day 2018 on the 10th. We both hope to see you there! 15-minute FOTO is our Clean Language-inspired coaching game, an essential and memorable component of every Agendashift workshop. We have released it under a Creative Commons with-attribution licence to enable its wider use and to encourage adaptations. 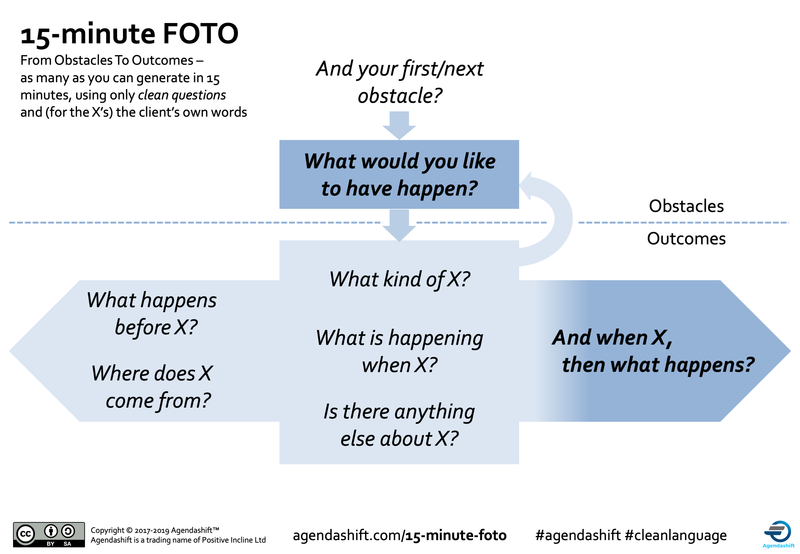 FOTO stands for “From Obstacles to Outcomes”, and you have 15 minutes to generate as many as you can, using only the questions on the cue card. An example of “generative over prescriptive” if you like.